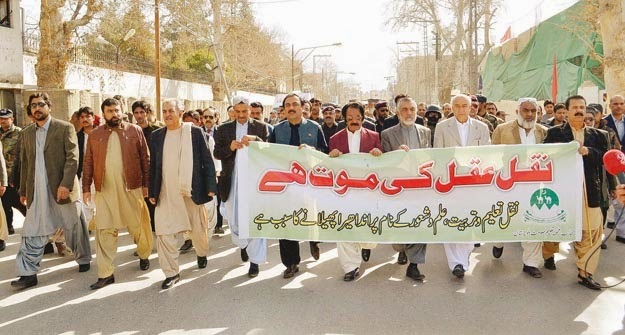 In order to improve education in Balochistan, Chief Minister Dr Abdul Malik Baloch announced an education emergency in Balochistan on January 4, 2014. It has been almost 15 months since the education emergency was announced and it has proved to be nothing more than a political gimmick. The education emergency announced by the Balochistan government was flawed from the outset. Since day one there was no clear strategy for implementation of said emergency. The government of Balochistan didn’t specify which government departments would come under the ambit of this emergency and what reforms will be initiated. On the contrary, there was too much emphasis on promoting the rhetoric that the government is determined to increase the literacy rate in Balochistan. In the provincial budget for the fiscal year 2014-15, 26 percent of resources were allocated for education but the need for a robust and comprehensive strategy was missing altogether. The Balochistan government initiated some immature procedures in the name of the education emergency such as installation of CCTV cameras in examination halls. Matriculation exams that took place in February this year became the focus of the emergency rhetoric. The Balochistan government spent a great deal of taxpayers’ money on promoting the use of CCTV cameras and dubbed it as a ‘revolutionary’ step by Dr Malik and his cabinet. Ultimately, the education department of the province failed to install CCTV cameras in all examination halls as they had claimed earlier. Cheating was controlled to some extent but couldn’t be rooted out altogether. The Balochistan government’s obsession with controlling cheating to end education problems is based on a flawed understanding. Policymakers in Balochistan fail to realise the difference between causes and consequences of education sector problems. Cheating in exams is a consequence of lack of teachers and other infrastructure-related problems. A problem can be solved only if its causes are addressed; it can never be solved by eliminating its consequences. The inability to understand this basic distinction has led to expenditures of millions of rupees on controlling cheating – all of them useless. Likewise, lack of understanding is not the only reason that has failed the education emergency. There are serious reservations on the sincerity of the Balochistan government on bringing improvements in the education sector. The educational future of 277 students of Balochistan is at stake due to the apathy of the Balochistan government. These students are studying in different institutes of Punjab under the Chamalang Beneficiaries educational programme. Under the programme, 50 percent expenses of the students are paid by Chamalang administration and 25 percent each by the governments of Balochistan and Punjab. Surprisingly, the Balochistan government has failed to pay its share of expenses for the last two years. The parents of all 277 students have been instructed by institutes in Punjab to not send their children until the Balochistan government has cleared the expenses. Everyone is justified in asking the Balochistan government what sort of education emergency it has imposed where even a few million rupees are not being paid on time. Moreover, earlier this month young schoolgirls in the Buleda Tehsil of District Kech protested against lack of basic infrastructure in their school. They carried placards saying: ‘We should be provided teachers so that we are not deprived of the blessing of education’. The girls were protesting against lack of teachers, school boundaries and drinking water in their school. What they didn’t know was that, being far away from media attention, their school is not part of the agenda of Balochistan’s education emergency. Ironically. these girls belong to the hometown of Chief Minister Dr Abdul Malik Baloch. Due to its underdeveloped nature Balochistan is the centre of attention for many non-governmental organisations that work for promotion of education. Without naming anyone, almost all of them have failed to contribute anything meaningful to the education sector of Balochistan. These so-called social welfare organisations organise seminars in lavish hotels, conduct token awareness walks, distribute a few booklets – and that’s it. This attitude of NGOs along with the failure of the government is compounding education problems in the province. In order to make programmes like the education emergency effective, the incumbent government needs to drop the political rhetoric attributed to them. The government should let the increase in literacy and enrolment rates speak for themselves and avoid spending too many resources of this poor province on advertising the education emergency. Having said that, the current education emergency can be made effective by conducting a detailed assessment of all schools and colleges in the province. This is a must for the success of any education-related strategy because there is a dearth of accurate data about education. Once the data is available that is when a comprehensive strategy needs to be formulated which clearly defines the role of every government department and their targets within a definite timeframe. That will provide the basic framework under which different objectives can be set for improvement of education. The bigwigs of the incumbent Balochistan government need to realise that education is not something that can afford petty politics. The future of millions of children of Balochistan is dependent on the success of this education emergency. Education is what makes or breaks a nation and its importance increases exponentially in the context of insurgency-wrecked Balochistan. The government needs to take a bold step and divorce all sort of politics and bad governance from the education sector. Leaving education aside, there are numerous sectors that are fertile ground for politics. The Balochistan government must depoliticise the education sector and start work on improving it on a war-footing.